Leisure, luxury and healing with traditional Panchakarma treatments is what retreat participants can expect during their 28-days Panchakarma retreat at Shreyas Bangalore. The Panchakarma treatments are ancient Ayurvedic methods to purify and detoxify. Panchakarma translates to ‘5 actions’. They are traditional Ayurvedic practices with great purifying and rejuvenating abilities. The Panchakarma Treatments can be divided into 3 phases. The first phase is ‘poorva karma’, preparing the body for the treatments. The second phase is ‘pradhana karma’ following the principal procedures and the last phase is ‘paschat karma’, post treatments before returning home. First of all, the Ayurvedic doctor will make a diagnosis in a personal consultation. Based on this diagnosis, an individual program of Panchakarma is designed for each retreat participant of the 28 days Panchakarma Retreat at Shreyas Retreat Bangalore. The setting couldn’t be any more tranquil and inspiring. This retreat centre features a beautiful design, surrounded by stunning nature and peaceful ponds. On top of that, the resorts facilities are extensive and services are of 5-star resort quality. Shreyas Retreat Bangalore is a place to go to for spiritual growth without having to give up on modern luxuries. Each personalized Panchakarma program features an abundance of daily Ayurvedic treatments, yoga practices, meditations and doctor consultations. There are also Ayurvedic cooking classes to attend and there are counseling sessions to attend to keep up this healthy lifestyle after the retreat. Group yoga classes are held twice a day and there is a daily chanting/meditation lesson held in the afternoon. All of this is included in the price of this all-inclusive 5-star holistic health retreat in India. The ancient traditional Panchakarma rituals for cleansing, relaxation and healing include Abhayanga, Choornapinda Swedam, MetraVasti, Nasyam, Navarakizhi, Netratarpana, NiroohoVasti, Shirodhara, Thalam and Virechana. Sheyras Retreat Bangalore is an amazing haven to heal, relax and purify, offering experiences to change one’s life forever. ‘Athithi devo bhava’ is the motto of Shreyas Retreat Bangalore, translating to ‘a guest is to be served as God’. 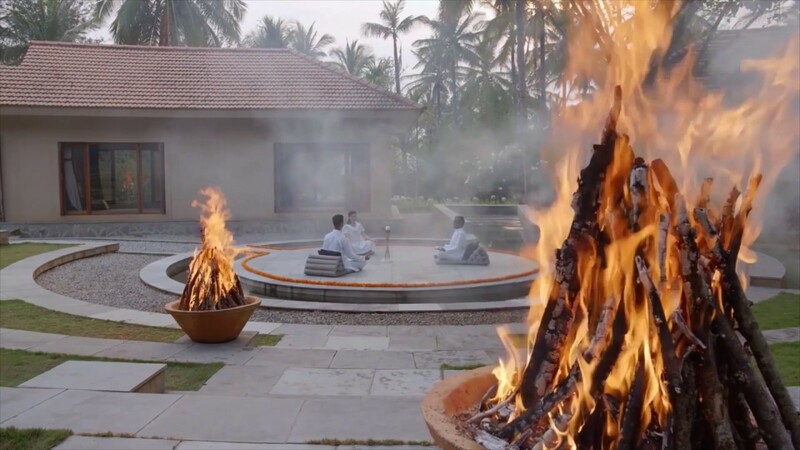 This luxury, holistic health retreat is quite something special indeed, located in Bangalore, 1 hour from the international airport of Bangalore. This beautiful resort spread out across 25 acres of sprawling gardens is a place to find peace of mind. It is a luxury haven to recharge, relax, rejuvenate and heal the body, mind and spirit. Ayurveda, yoga, holistic healing, outstanding services and amazing recreational facilities are key elements of Shreyas Retreat Bangalore. If not practicing yoga and meditation or consulting Ayurvedic doctors and experiencing the healing capacities of Ayurvedic treatments, guests can swim in the inviting infinity pool, relax in the heated jacuzzi, steam in the sauna and work out at the gym. Other possibilities are to watch a movie at the home theater, go for a run on the dedicated jogging trail or see the organic garden and the amphitheater of the resort. Shreyas features all-inclusive luxury retreats that make great escapes from daily life. This retreat centre in Bangalore has done an amazing job combining spirituality with leisure and luxury in a super spacious yet intimate setting. In total, the resort houses 12 cottages scattered around on the expansive 25 acres property of Shreyas Retreat Bangalore. There are 3 deluxe poolside cottages fitted with king-size beds, there are 8 garden tented cottages and there is 1 family cottage with 3 bedrooms. All of the cottages feature air-conditioning, electric kettles and tea, speedy wifi, desks, safety boxes and private en-suite bathrooms. The retreat is inclusive of daily dosha-specific vegetarian meals (breakfast, lunch and dinner) served in the dining area. All the food is made with carefully selected organic ingredients of which most comes straight from the onsite organic garden. 1. Any cancellation made more than 30 days prior to arrival date will not incur any cancellation charges. 2. The deposit will be returned. For any cancellations received 5 to 30 days prior to arrival, 50% of the full amount will be charged (there will not be any refund of the 50% deposit the guests have paid). 3. Any cancellation received in 0 to 5 days prior to arrival will be charged 100% of the total amount of the stay. 4. Any reduced stays whilst at the Retreat will still incur a cost of 100% of the total price; there will be no adjustment for early departure. 5. No shows will incur a charge of 100% of the full amount. Note: Christmas / New Year: A minimum stay of 5 nights is required between 20 December and 15 January. The 3 Poolside cottages overlook the signature Antique-Pillared entrance - open your door and step out to an infinity pool surrounded by flowering frangipani trees, an outdoor heated Jacuzzi and the central courtyard of the retreat. All cottages have ensuite bathrooms. The Poolside cottages have King-size beds (twin bed-configuration not available). The cottages are suitable for 2 adults. 2 children under the age of 8 can be accommodated free of charge (a mattress is provided). The Poolside cottages are wheelchair-accessible. The Garden 'tented' Cottages, with a canopied roof, spaciously scattered across the property are surrounded by lush vistas of greenery. The Garden cottages have en-suite bathrooms that open onto private walled courtyards. All cottages have a verandah in the front. Feel one with nature as you hear the sound of birds and the rustle of the coconut trees, or watch the stars as you shower. These one bedroom Garden tented cottage offer twin sharing or double bed configuration. For guests who are very sensitive to sound or very light sleepers, we recommend the Poolside cottages since the canopied roofs make these cottages less insulated to outdoor sounds.